Today is Raffaele Cazzetta’s birthday. Happy Birthday Raffa70. I thought on this occasion I would write up the interview that I did with him during the Fancy Food show last month. I met Raffaele in Apulia earlier this year during a trip to the Salento. The Salento is the very tip of Apulia which is the tip of the Italian Peninsula or the heel. I love Apulia. I must have 30 guidebooks to the area and went on a beautiful trip there in 2002 with friends. We drove all over the Salento for 10 days. I remember swimming in the water and feeling as though I was swimming in an Emerald. The water there is actually a brillant green. I had thought that the photos were touched up when I saw them in my guides but truth to be told, the water was that color. I went all over to Gallipoli, Ciolo, Lecce, Otranto, Castro and many places in between. This trip I was staying in beautiful home near the Duomo of Lecce. What a gorgeous city. They say that Lecce is the Paris of the South and I can certainly see why. It is all made with a warm yellow stone called Pietra Lecchese. Raffaele’s lovely wife Georgia owns a huge quarry of this stone and her family is quite important in the stone sector. Pietra Lecchese is a favorite building material of many of the world’s architects and Georgia it seems has worked with them all. The Cazzetta family is a historical one in this part of the Salento, starting their olive farm in 1899. Raffaele told me that he grew up following his grandfather into the olive groves in an open chariot when he was small. 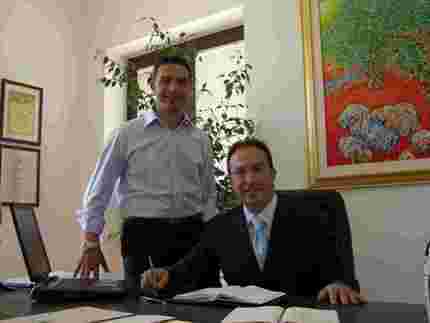 Raffaele eventually became the head of the family property and has been working in the business ever since. 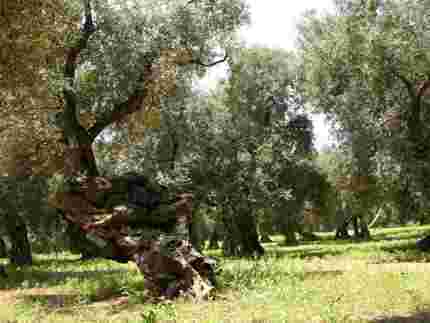 They have 300 hectares covered with olive trees. Raffaele is the fourth generation to run the farm. The two indigenous varieties used in his olive oils are Ogliarola Salentina and Cellina di Nardo’. The olives are all pressed within 24 hours of harvesting. They are cold pressed at a controlled temperature in stainless steel storage tanks. Cazzetta makes four types of oil: Prezioso-an extra virgin olive oil, Masseria Quattromacine-also an extra virgin olive oil, Spontaneo – the first press extra virgin olive oil, and an organic olive oil. The firm can make up to three million liters of olive oil a year but only bottles about 300,000. The rest of the olive oil is sold to other firms. Prezioso is somewhat fruity while Masseria Quattromacine is a blend of olives from different producers and the family farm. Spontaneo is the purest of the olive oils and doesn’t go through any filtration but is obtained by squeezing the fresh olives directly. The Cazzetta family is also able to guarantee traceability and has a hand in all phases of the production process from tree to bottle. Raffaele told me that he had always loved the family farm. 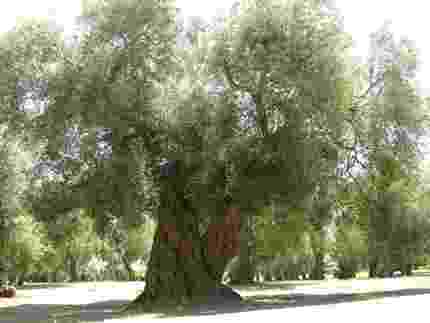 He has many 100 year old trees and is thinking of creating a program to have people adopt an olive tree. “There’s just nothing like looking at the silver of an olive tree against the blue background of the sea,” he told me. I tend to agree with him. 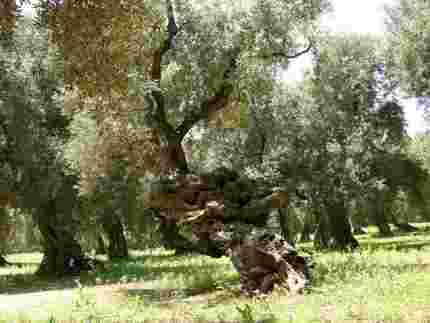 His olive grove was among the largest and most beautiful I have seen. Raffaele told me that this area of the Salento was very lucky because it had a great microclimate thanks to its proximity to the sea and the drying effect of the prevailing winds such as the Scirocco and the Tramontana. The Scirocco hails from Africa and brings humidity the Tramontana from the North blows in and dries out the humidity. If there’s too much Scirocco, they use copper spray to protect the plants. “We are moving towards certification for all of our property in terms of organics,” he added. He was quite optimistic about the growth of his product in the United States. “Thus far only 3% of consumers use olive oil here. The other 97% still remain to be captured or captivated by olive oil, he said with a gleam in his eye.